Seeing as my ‘book-in-progress’ is up on the Unbound website seeking to make its way into the world, I thought I’d better say something about this whole shebang. Be part of a revolution, says Unbound, an innovative independent book publisher. Time will tell if that’s true, but this is certainly a different way of doing things. People vote with their wallets for the books they want to see published. Those who sign up with Unbound (via their website unbound.co.uk) can choose to back books (pledge) using a bank card or Paypal. The Wake by Paul Kingsnorth (published). Longlisted for the Man Booker prize in 2014. A feat of imagination – a story told in an invented language, set in a fascinating, shadowy part of history. 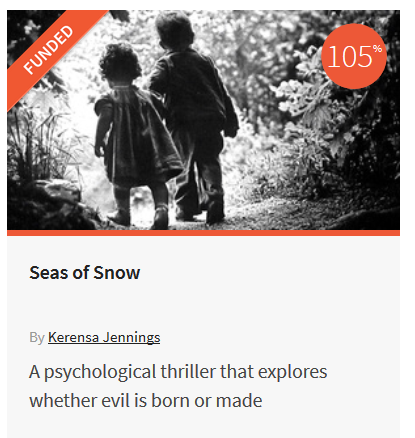 Seas of Snow by Kerensa Jennings (funded). Promises lots of dark goings on, including childhood abuse. Central theme: Is evil born or made? Stand-out poetic language. It’s worth watching the pitch video, too, it’s very cleverly made. 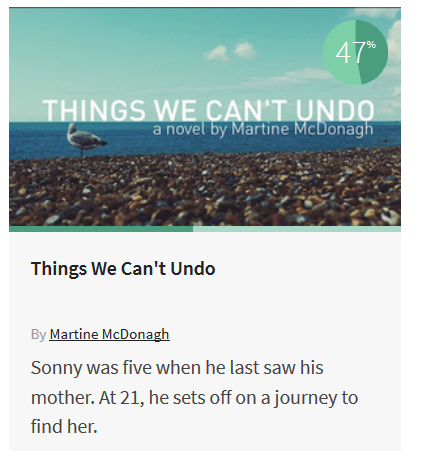 Things We Can’t Undo by Martine McDonagh (being funded). The punchy, confident voice in the opening pages pulled me into this coming of age novel with special appeal to Shaun of the Dead fans. Though I’m biased towards novels, Unbound has a huge selection of enticing sounding non-fiction too, such as The Dissent of Man by J.F. Derry (Darwin’s influcence on everyone) and The Choice by Ruth Pitt (a topic that resonates with me, the history of women’s struggle to balance work and family). 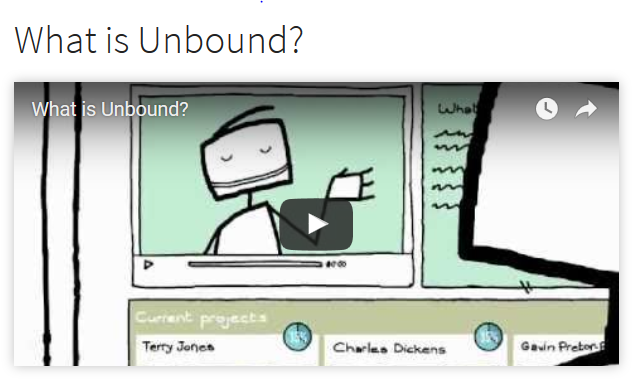 What’s the attraction of Unbound and crowdfunded publishing? For me, getting the backing of a highly thought of independent publisher that’s going places must be a good thing. Their innovative approach to publishing offers a real alternative to traditional publishing models, combining the book patron concept popular a few centuries ago with the modern technique of crowdfunding. Their mission (stated on their site) is to give readers, not publishers, the power to decide which books get published and to help more authors make a fair living. Because books are funded up front, Unbound can take creative risks, choosing projects that may appeal to readers that have been neglected or who want something beyond what is offered by mainstream publishers. For their part, authors get the freedom to write the book that they want without having to make compromises induced by the need to sell enough copies to cover production costs. Plus they get excellent promotion and 50% of royalties. Raising three grand plus for a first novel by an unknown, uncelebrity writer is by no means easy. What’s crucially important – apart from the work itself, of course – are one’s networks, the ability to promote oneself and to be creative and persistent with marketing. Everyone approaches the task differently and has their own strengths and weaknesses. If (like me) your networks are on the lean side and heavily populated with impoverished artists/writers/poets, and the idea of having to constantly brag about your brilliant (of course) book brings you out in a rash, you are not the ideal candidate for crowdfunding. On the other hand, maybe you have a whizzbang idea (for non-fiction, that is) or you write like an angel on acid, or you’ve simply got a damn good book… Tenacity and bloodymindedness count for a lot, for sure. You need to be able to hang in there when no one has pledged for a few days and you’re asking yourself yet again, Why the hell am I doing this crazy thing? How did you come to be crowdfunding your novel? I submitted my novel Ghosts of Chechnya to Unbound around October 2015 as I really liked the look of their website – both the quality and originality of their books and their fresh way of doing things. I didn’t expect it would get picked as they get lots of submissions and two excellent writers I know had been rejected by them. 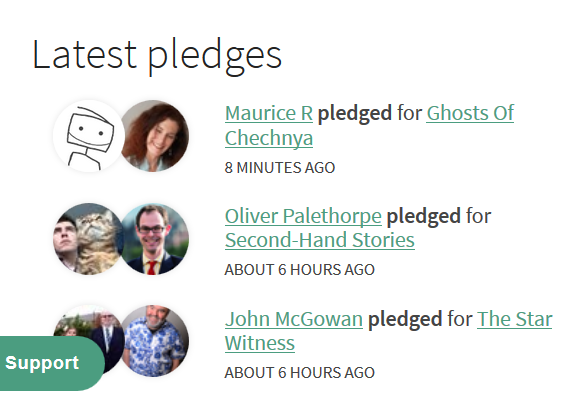 So I was chuffed when they replied in November saying Ghosts of Chechnya would be published under their new digital list, once it meets its crowdfunding target. It’s a psychological thriller blended with a love story set around the 7/7 terror attacks on London, about a young London woman who falls for a potentially unhinged Russian ex-soldier she knows little about, and the consequences of that. How do people find your book? A short video about Ghosts of Chechnya is on my Unbound project page, along with an extract: https://unbound.co.uk/books/ghosts-of-chechnya (or from the home page, go to Find a Book then Thriller.) From this page one can sign up to Unbound and pledge for the book. What is the money used for and how is it raised? Unbound won’t publish my novel until I have reached a target (around £3,500 for e-books, covering things like structural editing, copy editing, proofreading and cover design). 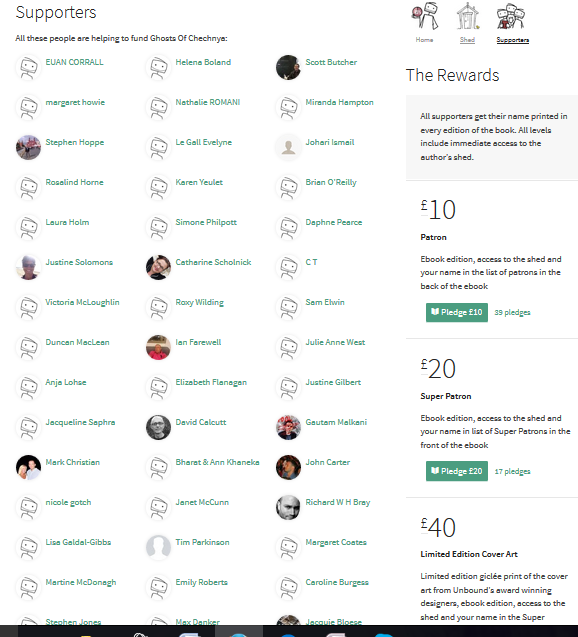 To do this, I need to gather sufficient ‘pledges’ via their website (www.unbound.co.uk) within 90 days, ending around 22nd February 2016. If for any reason the project doesn’t reach its target, Unbound will offer to refund each pledge received. As of 13/1/16, the book is 36% funded. 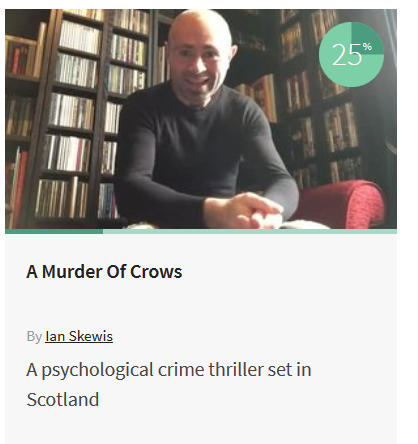 It needs a maximum of 228 more £10 pledges to get to 100% (much fewer higher-value pledges). What do people get if they pledge? What should people know about your book? Ghosts of Chechnya (mainly extracts of previous drafts) has received excellent reviews by fellow writers and the occasional HarperCollins editor (see the Reviews page for a selection). It is controversial and timely, dealing with radicalism, terror attacks and the suffering of conscripted soldiers and civilians that took place during Russia’s second war against Chechnya. As well as a thriller and a love story, it is an anti-war novel. What would you say to anyone who’s considering supporting your book? Seriously, that would be more than welcome. Fingers crossed I’ll reach 100% sooner or later, and survive to tell the tale.